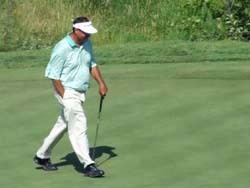 It&apos;s no wonder why Brad Bryant (pictured) came from behind to win the 2007 U.S. Senior Open title, the first Major win of his career. The numbers all support his game. Bryan fired a 4-under par 68 to cruise past Tom Watson, who led after both the second and third rounds to take the lead and the win. Briant his 11 of 14 fairways, an astounding (79%) on a windy day at Whistling Straits. Even more impressive, he reached 15 greens in regulation. His six birdies were among the best for a round all week. Bryan started the day 5-shots back. He won by three shots over Ben Crenshaw, who is also looking for his first major win.